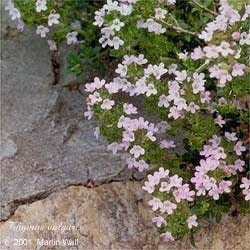 The genus name Thymus and common name thyme are thought to derive from the Greek thymon, "to fumigate," in reference to the plant's use as incense. Thyme, native to Europe, Asia, and northern Africa but widely cultivated, is a semi woody plant growing to between 6 and 8 inches in height. It has small, flat, oval leaves that range in color from gray-green to dark green. The tiny, aromatic, hermaphroditic flowers are lilac, white, or pink in color and grow in loose spikes. Thyme prefers light, warm, well-drained, and somewhat dry soil, along with full sun. It requires little care in the garden. Thyme helps loosen mucus, soothes inflamed mucous membranes, loosens the bronchials, and promotes tissue repair. It also strengthens the immune system and nourishes and warms the lungs, nerves, and adrenals. It is used in the treatment of alcoholism, asthma, bronchitis, colds, colic, coughs, depression, diarrhea, dysmenorrhea, dyspepsia, flatulence, flu, hangover, hay fever, headaches, herpes, hysteria, indigestion, laryngitis, pleurisy, rheumatism, shingles, sinusitis, sore throat, stomachache, tetanus, tuberculosis, whooping cough, and worms (hookworm, roundworms, threadworms). Topically, thyme cleanses infection and increases circulation to the area to which it is applied. It can be used as a gargle or mouthwash to treat dental decay, halitosis, laryngitis, mouth sores, plaque formation, sore throat, thrush, and tonsillitis. As a compress thyme treats bronchitis, bruises, colds, congestion (in the lungs), flu, insect bites, mastitis, and wounds. It can be prepared as a soak to treat fungal infections such as athlete's foot, ringworm, and parasites such as crabs, lice, and scabies or as a douche to deter candida. Thyme tea can be used an as eyewash for sore eyes and as a hair rinse for dandruff. As a bath herb, it relieves sore muscles, arthritis, and the congestion and achiness of colds and flu. Thyme is a common culinary spice and also aids in the digestion of fatty foods. Thyme-infused honey is excellent. As a tea thyme is congestion-relieving, stimulating, and aromatic. In ancient Roman times thyme was burned to deter scorpions. It is still used for embalming. The essential oil is used in perfumery, cosmetics, and soaps. Avoid therapeutic doses during pregnancy.